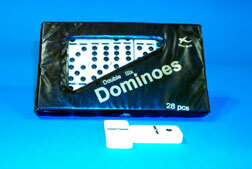 Full sized double-six dominoes. Smooth edged and highly polished. Includes vinyl case. $3.30 each for 36 or more. $2.85 each for 75 or more.